Today I bring you another great shaving soap from Canada the company goes by the name PC Beauty which stands for Pat Costello. Pat has passion for what he’s does and it shows in all of his products. Only the finest ingredients are used here but you wont find them pushing the “ORGANIC” pitch. Pat explains it this way. “We have too many holes in the process to give it any validity. 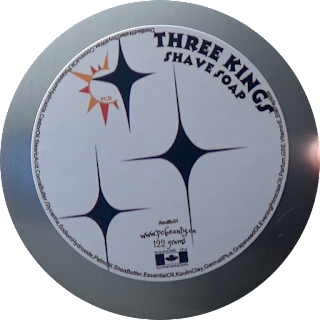 It’s just not worth paying for it anymore.” His soaps are all vegan and after using the Three Kings last week I can say it speaks volumes to quality. Unfortunately, the tin could use a little TLC. Three Kings comes in a light gauge 122 grams’ tin with labels only on the top no side labels so if you stack your soaps your out of luck. In extremely small print the company website URL, location and grams are here and in slightly larger letters the product name. It took me a long time to find any information regarding the company name but after 5 min of looking in very small print I found the letters PCB sitting inside a graphic star placed in the design. Being around advertising for most of my thirty-year career I find this label lacking in brand identity. I know I’m nit picking and this has nothing to do with the performance of the product but I can’t help it. Also this type of tin I’ve seen before and doesn’t fair well with postage. Furthermore, they can dent very easily when dropped or stacked. These are my only issues to an other wise amazing shaving soap. The scent is combination of 11 essential oils. Finding all of them could be tuff even for the most experienced nose. We have Cedar wood, Bergamot, Benzoin, Frankincense, Coffee, Key-Lime, Vanilla (10), Clove, Vetiver, Orange Sweet and Peppermint. This makes for a very interesting scent indeed. One would think with a combination such as this it might be overpowering but the scent turns out to be on the light side. After being with for a while I have noticed the woodsy scent up front and as hard as I try I can’t detect any peppermint. The tools for this shave are my Maison Lambert brush and German Razorock slant. I bowl lather and had no issues with soap. It was very soft and easy to place into the bowl. 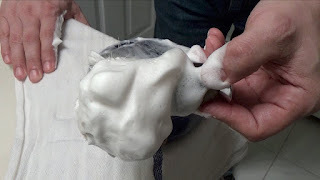 I ran warm water over the brush and emptied it right into the bowl and created a rich, creamy, lather in less then two minutes. It was 5 days since I last shaved and the lather was able to cover my face getting into my thick beard with ease. The razor was gliding over my face with no irritation allowing me to go over tuff spots without the need for more lather or a second pass. Regardless of my nit picking the tin and label this is a great shaving soap. The scent is truly unique and the performance outstanding. Although this has a light scent don’t let that turn you off from giving this a try. The great lather, slickness, glide and post shave feel will make up for the difference.